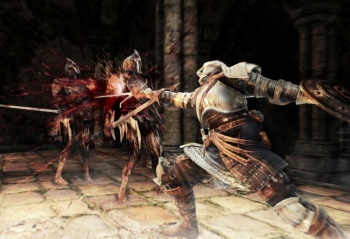 The emphasis on exploration in Dark Souls 2 may let players to complete story chapters in whatever order they choose. The original Dark Souls was recognized for its brutal difficulty, but it in many ways it was still a fairly linear game. Players needed to complete the game's chapters in a particular order, which when you think about it, doesn't always make sense in an open-world environment. According to director Yui Tanimura, this is one feature that From Software would actually like to change in Dark Souls 2. By placing a stronger emphasis on exploration, Tanimura wants players to have the freedom to go wherever they want in the game, even if that means skipping halfway through the story to face more advanced enemies. "Freedom of exploration is something we want to prioritize for Dark Souls 2, even more so than Dark Souls 1," Tanimura said. "We realize in Dark Souls 1 there were some certain orders, like ringing the bells or going to Anor Londo, which is not necessarily a bad thing. In Dark Souls 2, we're hoping we can provide more freedom so things don't have to necessarily be done in a certain order. We're hoping that if the player tries hard enough, or are willing enough, they could even start halfway through the game, depending on how willing or how brave they are." Of course exploration of this sort isn't necessarily new; even early Legend of Zelda games let players explore the entire world map. Unlike Zelda however, it sounds like Dark Souls 2 would let players experience later chapters of the story without requiring plot-advancing items or keys. Sure, especially challenging monsters may bar your path, but for Dark Souls that's really par for the course. Of course, for the story to meet open-world sensibilities, the plot would need to be equally flexible. Thankfully, Tanimura seems to think that won't be a problem. "You won't have to follow a certain line, it will be unique for all players, I think," he explained. "It might be an interesting aspect that players will be able to enjoy a little bit more than Dark Souls 1." What I'd like to know though is whether these advanced sections would be designated as late-game events. After all, if all enemies are equally punishing to new players, how will you know if you accidentally wandered into the game's halfway point or not?